Alex White has compiled an impressively thorough dissertation on the relationship of typography and design in the world of advertising. 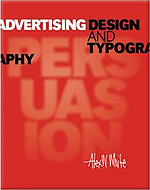 The text is complemented with a collection of 1,500 advertising examples spanning decades and continents. Here is the truth: you will read this book more than once, and that is a good thing. You’ll pick it up, feel its heft and presence, admire the nice cover design, flip through the pages, and sit down with all sincere effort to read the thing cover to cover. Fortunately, Alex White simply does not allow that to happen. The book boasts 1,500 advertising examples from all over the world, and every page is packed (seriously, packed) with good and bad ads that reinforce whatever message Mr. White is trying to get across. Don’t bother trying to read this book’s actual text the first time through. Fighting the distraction from the library of full color reproductions is fruitless — just give in, and spend your first pass absorbing one of the most complete archives of contemporary advertising available. Only after you’ve pored over every page the book like a kid through the toy section of the Macy’s catalog are you ready to read the actual book. Mr. White’s clear and concise prose is a treat. He delves into a variety of topics, spinning out dozens of observations, opinions, and chunks of analysis, each thought an electron spinning around the central theme of advertising. While Advertising Design and Typography touches on researching clients and markets, some minor points on the web, radio, and TV, the brilliance shines through in his critical review of design and type in the world of print advertising. He explores their relationship at length. Going beyond best practices in basic design and branding, he explores how type and layout define the personality of an advertisement, from classic war posters in the 1940s to Apple’s silhouette iPod ads. Mr. White is not afraid to nerd out on the reader, and uses concepts and terminology art school grads will get all fuzzy over. Color is a recurring theme (triadic harmonies, anyone? ), as well as the effects and implications of different design techniques, including scale, illusion of depth, hierarchy, contrast, and much more. Toward the end, the book digs into typography with the enthusiasm of a kid looking for buried treasure. Specimen after specimen is displayed and dissected, from titling letters to body fonts, from using type as a design element, to symbols, logos, and pictograms. It’s difficult to think of a more comprehensive resource on the topic, and Mr. White manages to squeeze an incredible amount of experience and critical analysis into just a few chapters. Books of this importance and magnitude are too rare. Alex White has gone to some length to present the world with a comprehensive but accessible dissertation of the world of type and design within advertising, and his thought process and copious illustrations should be required reading for every designer, whether they spent four years in art school or not. It’s that good. And after you’ve spent several long sessions absorbing the text, and poring over the endless examples, you’ll leave this book on the coffee table, where its treasures can be discovered over and over again.